There was a time when people were aghast at the idea of Big Brother (not the TV show) and the Thought Police watching us all the time in George Orwell’s book 1984. To this day the idea of the FBI, CIA, NSA, etc. watching our every move makes civil rights activists cringe. Well, we’ve done it to ourselves. Yeah, we have blogging but that still goes through a person’s brain and out their fingertips so things get edited. And we have Twitter where people are constantly updating their every move. 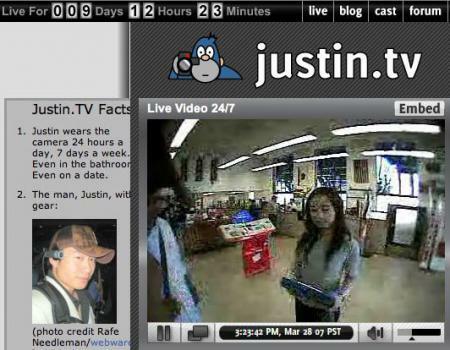 But behold justin.tv where this dude has got a strap-on 24/7 (strap-on video camera that is). How does it feel to be the Thought Police? I’ve got to get back to work at the Ministry of Truth. See ya….